With version 6.5 of the Elastic Stack, we released two new ways to interact with your data: the Infrastructure and Logs UIs. These are both in beta in 6.5, but more about that later when I will ask for your input. For each of these, I would like to talk a little about the motivation, the user experience, and the configuration of the UI. Let’s start with the Logs UI. A souped up tail -f with the most recent at the bottom experience; a visual experience with tables, charts, tag clouds, etc; or a tabular view. You should be able to work the way that is best suited to you, and the openness of the Elastic Stack supports that. Compare this to popping open a terminal, authenticating with your k8s provider, figuring out which pods you want and running kubectl logs -f … | grep 404 (or in the non-container world finding the host names, sshing in, tailing the logs, etc.). We want to make your life easier and give you your data in the way you want to see it. Don’t forget to restart Kibana. Reopen the Logs UI and click on Stream Live and you should see all of your Logstash and Filebeat logs streaming into the Logs UI. Finding out that something is broken, then opening a monitoring system to dig in. Charting key indicators for all of the systems on a big dashboard and watching that, then digging in to the problems. Automating Ops with machine learning discovering normal behavior, detecting emerging issues, and alerting Ops. The Infrastructure UI is designed to get Ops to the “charting key indicators on a big dashboard” stage. It's safe to say that we all need to get to the “automated with machine learning stage”; you can read more about Elastic machine learning, and if you watch the video at the end of this post you will see a workflow that starts with an alert from a machine learning job and moves along from there through APM and distributed tracing, the Infrastructure, and Logs UIs. 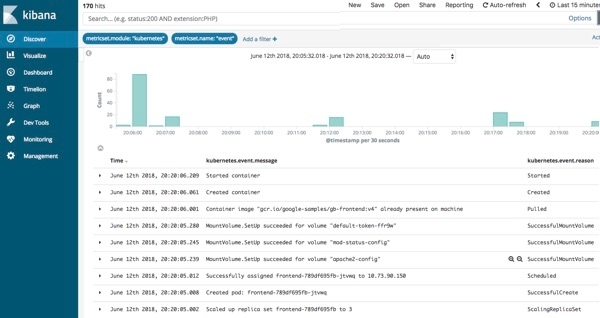 Having all of the logs, metrics, APM, and distributed tracing all together in Elasticsearch allows you to use all of the analysis and visualization tools across all of your data. Let’s take a look at the Infrastructure UI, and then dig in. In this view we are looking at Kubernetes pods, and I have them grouped by namespace. I am looking at the inbound network traffic. By right clicking on one of the pods I can jump to the logs for that pod, or to a curated metrics dashboard for that pod. Three types of devices are supported today: hosts, Kubernetes (k8s) pods, and Docker containers. The power of the Infrastructure UI is that you can see the state of key indicators for a very large number of devices. At high volume, you have colored squares with no text until you drill into an interesting subset by using the search bar or clicking on a group. You can also launch into the logs for a device or display a metric dashboard. If none of the above groupings support the way you want to interact with your data, then use the search bar. 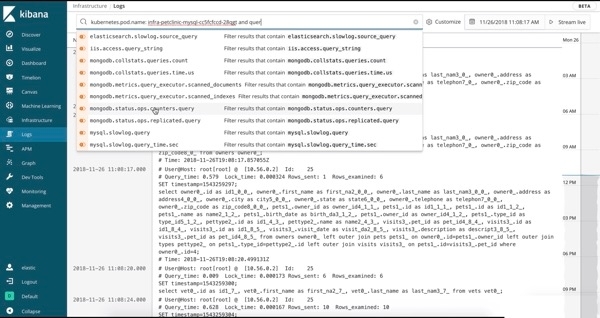 Just start typing and the Kibana Query Language (KQL) autocomplete feature will guide you. I provided an example in the GIF of the Logs UI up top, as I started typing kubernetes Kibana offered labels and then tier, and then provided the possible choices based on what was indexed into Elasticsearch. There is very little configuration to be done for the Infrastructure UI. Just deploy Metricbeat and enable the System module. If you are running containers, then also enable the Kubernetes and Docker modules. Both of these are beta UIs, and we would love your feedback (and keep the feedback coming even after they become generally available). Please tell us how you prefer to interact with your data. Are the groupings in this beta release of the Infrastructure UI sufficient to support the way that your team is organized? What would be better? Do we have the right metrics driving the colors? Do you need a different way to filter the logs in the Logs UI? 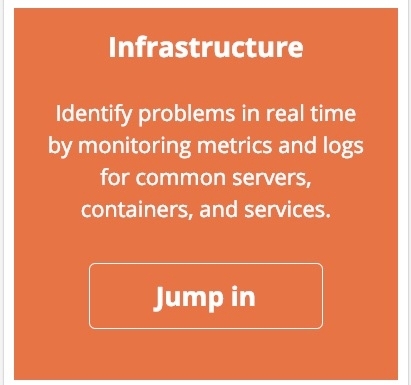 When you launch into the metrics view from the Infrastructure UI are you seeing the metrics that you care about? Head over to the Kibana Discuss forum and let us know what you like, dislike, need, etc. The developers read and respond to these discussions and love to hear from you. You can also open an issue, submit a PR, or keep an eye on either on GitHub. You can switch to the Kubernetes or Docker views, group the objects using the UI, or narrow the view with the search bar. Left click on a host, pod, or container and launch the Logs UI for that object. 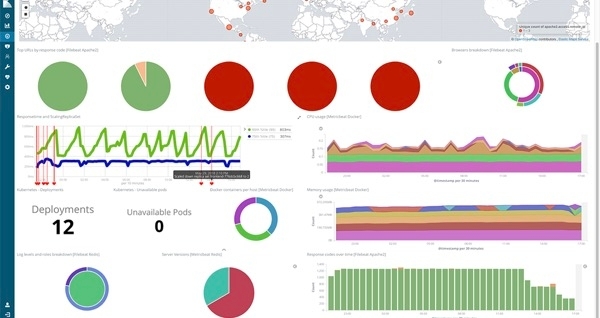 While you are at demo.elastic.co, have a look at some of the dashboards and visualizations. You can navigate to different areas from the landing page. Here is a video that shows the workflow of these UIs (also machine learning and APM with distributed tracing!). Thanks again for reading, and for your feedback!